Squash and Stretch Competition Winners! You’ve squashed and stretched all month and now we can finally announce the winners of our competition! Aardman animator Steve Edge judged the entries this month and was very impressed with the standard – well done to everyone who took part! New BBC Wallace & Gromit Music Competition! 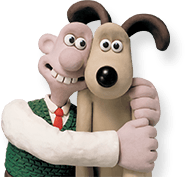 After Wallace & Gromit’s performance at the BBC Proms this summer, primary school children now have the opportunity to create a musical soundtrack for one of 3 specially selected Wallace & Gromit clips! The Pirates! Released on DVD! Aardman’s swashbuckling adventure, The Pirates! is released on DVD on Monday 10th September! To celebrate, look out for The film’s director Peter Lord, and screenplay writer, Gideon Defoe, who will be attending a special event at Waterstones in London’s Piccadilly on Monday 10th September. Learn How to Draw the Pirate Captain with Beano Max! COMPETITION: BeanoMax is giving you a chance to win some Aardman booty in this week’s magazine! Draw the Pirate Captain from Aardman’s The Pirates! for your chance to win an Animate It! kit, plus The Pirates! book and DVD.